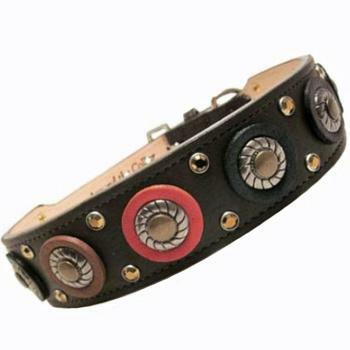 This handsome leather collar is available in black, brown, grape, or red, your choice. We will change the color of the disc to complement the strap color you choose. Example: If the collar you want is with a red leather strap we will replace the red leather disc with brown leather. If you want a black leather strap the disc will be brown leather and so on. The stone color will be antique gold. The center D-Ring is not available for this style. There is a D-Ring to attach the leash near the buckle. The "O" Ring is an extra touch. It hangs off the leather loop by the buckle to hold your dogs' tags. This collar is also tapered for comfort. The 1.5" collars taper to 1" and the 2" taper to 1.25"
Please note: The size is measured according to the dog's neck size. There are 5 holes and the size fitting the center hole closed is the size to order. To measure your dog's neck, take a piece of string and wrap it around your pet's neck where a collar should go. Mark the string, then lay it flat and measure it. That is the circumference of your dog's neck. Of course, tape measures work too! Our collars are sized when closed to the center hole. Please measure carefully since all of our products are custom made and therefore cannot be returned.